The aid industry has spent over $2 trillion since World War II to help spur the development of poorer countries, with not enough to show for it. Some people argue that the returns to the money spent are zero. Others argue that at least some of the aid money has had a positive impact. Most would agree, however, is that the productivity of aid spending has been very low. As Mari Kuraishi and I argue in our chapter of Reinventing Foreign Aid, a key reason for this low productivity is the lack of market mechanisms in the aid sector. Aid agencies face little competitive pressure - they almost never go out of business, even if they do a terrible job! By contrast, effective market mechanisms force out the poor performers, and enable effective newcomers to get traction and grow. Surviving in a marketplace requires constant innovation and efficiency gains. The good news is that Laura Freschi at AidWatch reports she is starting to see some of this competitive behavior with respect to the Millennium Challenge Corporation (MCC). 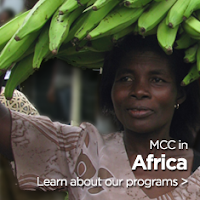 The MCC, which is only a few years old and may be concerned for its fate under the new administration, has been actively reaching out to stakeholders to get feedback and advice on how to innovate. Hats off to the MCC for this.